Thousands of new subscription boxes have launched in the last two years; however, only a few have reached one thousand subscribers. Sadly, many failed boxes did manage to grow to 10,000 or even 50,000 subscribers initially. What are the differences between the subscription boxes that grow versus the ones that never launch or those that stall? This answer can help you grow any subscription business to generate steady monthly recurring revenue. Stefan Pretty runs a software platform for subscription boxes called, Subbly. Thousands of boxes are managed with his software, and he has access to their proprietary numbers. I asked Stefan what the difference is between subscriptions that grow within a few months from the ones that never seem to get off the ground? He said, “People who tend to actually succeed in gaining traction quickly, are the ones who, either have a: experience, or b: sheer determination.” It takes tremendous drive to stay focused on what customers want and need, and are willing to pay for. Businesses who don’t succeed often over-focus on the wrong things or lose sight of customer satisfaction along the way. Maintaining a subscription base requires constant engagement with the customer. Ultimately, ” It’s the perceived value of the items in the box that’s really important.” Constantly ask yourself, “How can we add more value?” People love the element of surprise that comes with receiving a subscription box. It’s the “hook” that keeps them coming back for more. Once they are hooked on your subscription, keep them satisfied with excellent customer service and communication. Make sure every aspect of your subscription, from delivery, to marketing, to billing, aligns with your customer’s desires and expectations. Excellence in all aspects of the subscription is essential to retaining customers and boosting revenue. 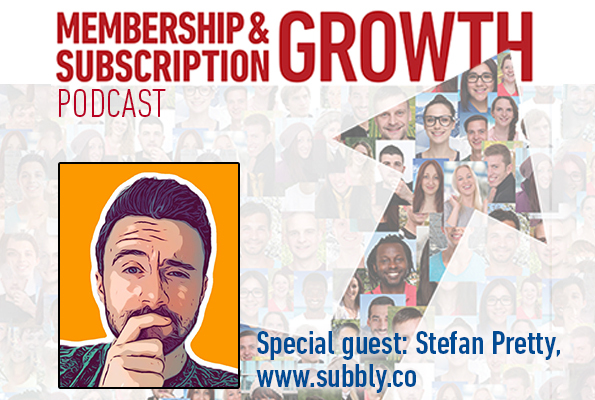 To learn more about how to deliver benefits members want and will pay for, listen to the full interview with Stefan on the Membership and Subscription Growth podcast.